Forget Facebook, forget Google+ and forget MySpace if you haven’t already, the real social network for the cool kids these days has to be Twitter. Introduced in 2006, Twitter has amassed over 200 million active subscribers and is responsible for serving 1.6 billion search queries each day. With the active and engaged member count growing daily, Twitter is the micro blogging service of choice. With the above information in mind, it’s a no brainer that when details of iOS 5 were announced, Apple told the world that they had worked closely with the developers at Twitter to deeply integrate the service into the mobile operating system and also included a framework allowing developers quick access to the service without needing to deal with the complicated Twitter API. With the public release of iOS 5, users can now take advantage of the built=in ‘Tweet Sheet‘, which is available through various stock applications and allows images and information to be sent direct to a user’s timeline through the configured Twitter account in Settings. As you might expect, the jailbreak development community have jumped at the opportunity to utilize this powerful new framework by coming up with innovative ways to use the new APIs and the native Tweet Sheet experience. The latest to be released onto the Cydia store is a free of charge tweak by developer Joseph Fabisevich and is called ‘QuickTweet’. No prizes for guessing what the tweak’s primary purpose is. When installed, QuickTweet adds an additional compose button in the bottom left hand corner of the Notification Center. When the Notification Centre pull-down is invoked, users will be able to tap the new compose button, and be presented immediately with a quick tweet option. No additional settings are added to the device’s SpringBoard or Settings application, and the Twitter accounts can be configured through the existing Twitter entry within the settings app [Settings >> Twitter]. Tweets will be limited to 140 characters, and from what I can see; there is no option to include an image with the Tweet, just standard text and emoticons. 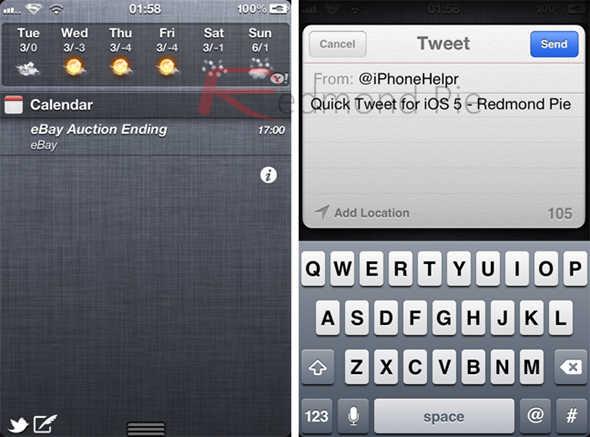 QuickTweet is available free of charge on the BigBoss repository in Cydia and requires iOS 5 or above.